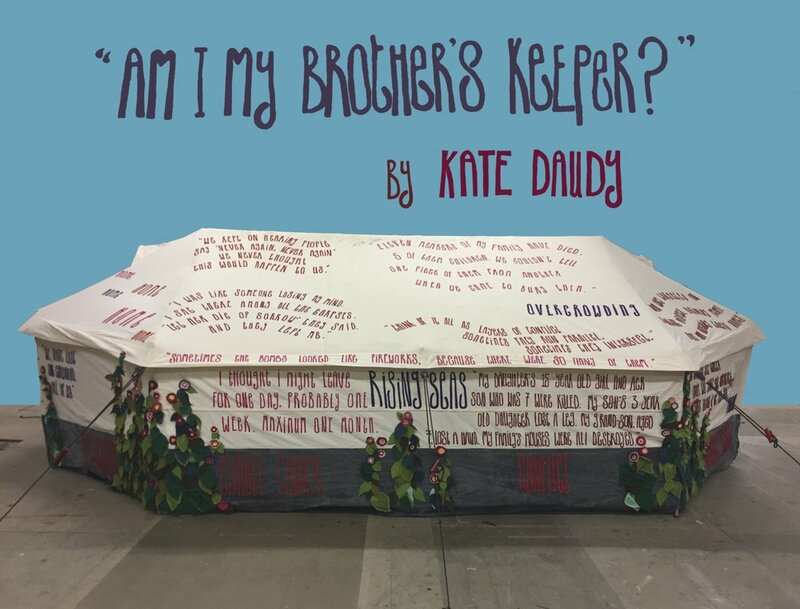 “Am I My Brother’s Keeper?” is an immersive multi-media art work about home and identity. It comprises now a podcast made in collaboration with cutting-edge UK radio station Rinse FM, a short film made by US documentary maker Odessa Rae, which has been seen by some 3.5 million people, a UNHCR desert tent in which a family lived for several months, on which Daudy inscribed observations from refugees from nearly 60 countries, and a funding project in Syria which commissioned crochet circles to be made by internally displaced ladies there. It is a work about human possibility. To research the work, Daudy travelled around the Middle East and Europe asking diplomats, refugees, psychologists, aid workers, doctors, peace-workers, volunteers, religious leaders and soldiers from nearly 60 countries for anything that could be learned for the future from this deep crisis, which now affects some 65 million people. The positive response to these interviews have generated further questions and an array of artworks, a film, a series of talks, processions and participatory performance pieces as the work travels around Europe and, from 2020, the United States, with the aim of raising an awareness of mans capacity to transcend circumstance and strive for a better future. The dignity and grace of the people she met touched Daudy all the more for the devastating nature of their circumstances. “Our life is what our thoughts make it,” as Marcus Aurelius says.